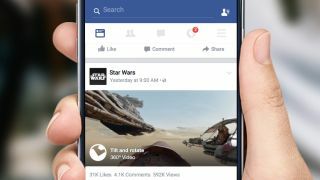 Facebook has announced that 360-degree videos will begin rolling out in News Feeds starting today. Rumors that Facebook would be launching the new video feature popped up last week, though it was suggested then that the feature would be launched through a standalone app. Instead, the social media giant today launched the feature as part of its video offering, which means 360-degree videos will available right on your New Feed. As part of the announcement, a number of companies have launched 360-degree videos, including a 360 experience from Star Wars: The Force Awakens that was made exclusively for Facebook, which you can view here. The video, for anyone interested, has you speed across the Jakku desert from the upcoming movie. Other 360-degree videos that are available to watch right now on Facebook include Saturday Night Live, VICE and GoPro, among others. By adding 360-degree videos, Facebook is playing a bit of catch up with Google, as 360-degree videos have been available on YouTube since earlier this year. "In the future, imagine watching 360 videos of a friend's vacation to a small village in France or a festival in Brazil - you'll be able to look around and experience it as if you were there," Facebook said, so we imagine the feature won't be available to just professional content makers. You'll be able to see the new immersive videos on Facebook through the web or on Android devices, with the feature to be rolled out to iOS in "the coming months." Facebook says that on the web, you can drag your cursor within the video screen to view the different video angles, while on mobile, you can move around the video by dragging your finger in the direction you want. And like with other 360-degree videos available on phones, Facebook says you can also "hold up your phone, and the 360 video will follow you as you turn, looking around, to experience things from all over the world like never before." The VR race: who's closest to making VR a reality?